Abbie is about to start middle school and, as she points out, everything that is "middle" is awful. She ought to know because she is a middle child. Middle school starts out just as terribly as she imagines. She doesn't share lunch with her two friends, she didn't pick an elective and is stuck in study hall, the cafeteria food is just as disgusting as it was in elementary school, and she doesn't have a "thing" like everyone else seems to have. In a burst of inspiration, she arranges a food trading network where other students can get the things they want and everyone is happy with their lunches. Unfortunately, the school doesn't appreciate Abbie's creativity and it looks like her thing might be getting into trouble. In the tradition of Wimpy Kid books, this story is full of illustrations. The entire story felt a little over the top for me in terms of Abbie's reactions to things and the events but it's obviously aimed at a much younger audience than me. Despite my skepticism, I was caught up enough in the story that I had to stop to think about why it was a problem for the kids to be trading lunch items which seemed like a genius idea to me. 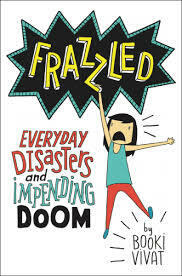 I know Frazzled will have a big audience at my school even though it didn't do much for me and I always appreciate any book that will make my students want to read. The one thing I know for sure is that I wish I had a superhero-esque name such as Booki Vivat rather than my boring, normal moniker. I am already imagining my superhero costume as Booky Vibrant the next time it is superhero day at school.